Fake Message Generator. | Kanishk's Technical Blog. Note From the Blog Owner: This trick is only meant for PRANK and Knowledge purpose. I will not be responsible for whatever you do with this trick. 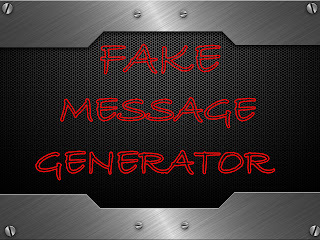 Here is a trick from which you can generate fake message onto your Friends computer and also fix a time at which the Message should appear in his computer and also set a time at which his computer should shutdown. Note: This Trick is not throught Visual Basic Script. This is something new. You can do this prank from a software I have. It is called THE FAKE SYSTEM CRASHER 2. As this Software is a freeware,you can Run this on any computer without installing it. Tip:You can use this on your friends computer or any Cybercafe. It is an easy to use software. You'll See the option of Enter Error Message Text below the Icon of this software which is like "!". Enter the text message you would like your victim to see. For Example: Hello,this computer has been hacked by a computer professional and He is using some tools to crash your System. Below the Option of Enter Error Message Tet you'll see the option of Show Every ___ Seconds. You can fix the time at which it should open. Here we have the following time " 1 Sec,2 Sec,4 Sec,6 Sec,8 Sec,10 Sec"
For Example:We will set a time of : 10 Sec. Look on the Right-Hand Upper Corner of the Window of this software,you'll see the Option of Error Type. In this software we have Four Options,they are : "Basic,Abort;Retry;Ignore,Exclamation,OK Button." Type the time you want the victims computer to shut down in Seconds measurement. and then click the option of Start Shut Down Command. Now Click the option of Force Crash !!!! to start the Error Message Box to start appear in the victims computer. After you click the Force Crash!!!! option the Software window will close. I Think many of people will try this trick and get caught too.Well,I have a Solution to this problem too. Open the task Manager and See active applications running,you'll find FAKE MESSAGE GENERATOR there too,Right-Click it and select the End Task Option. Try doing it 3 to 4 times and it'll stop. Posted in Fake Message Generator. its asking for .net frame work wat i do ?? Raj,you need to install .NET Framework 4.0 in order to install this software.